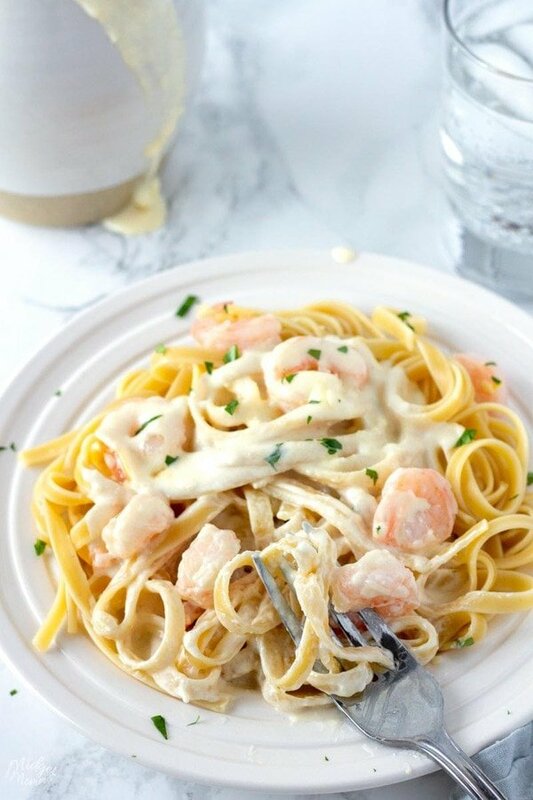 This Shrimp Alfredo is a family favorite in our house! 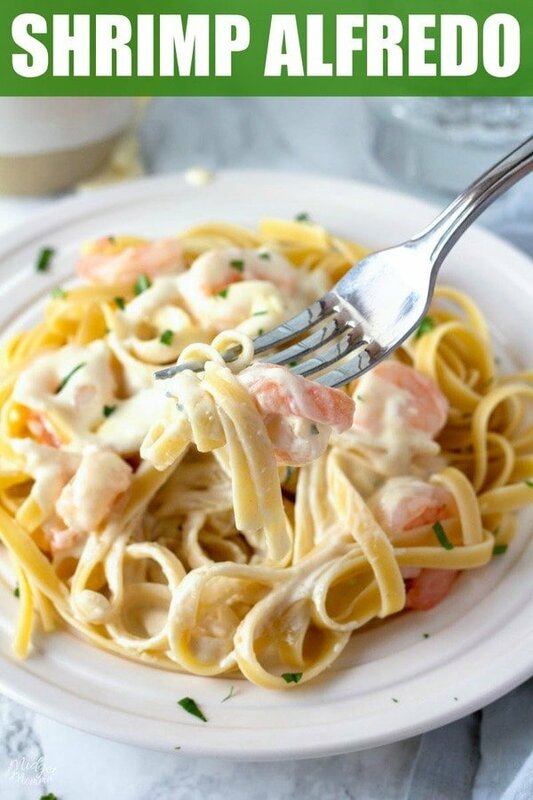 Seriously the kids ask me to make this Shrimp Alfredo Pasta for dinner just about every week. They never get sick of it! 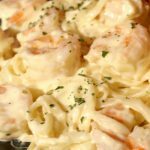 I use the best homemade alfredo sauce ever, add in the easiest ever to make garlic shrimp and we have our favorite dinner. 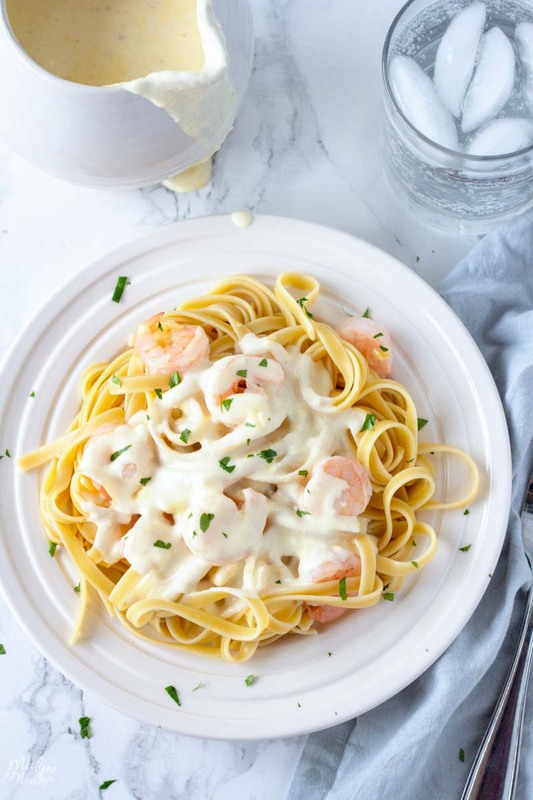 This Shrimp Alfredo recipe with homemade Alfredo sauce is always my go to meal when I need a meal that will make everyone happy. 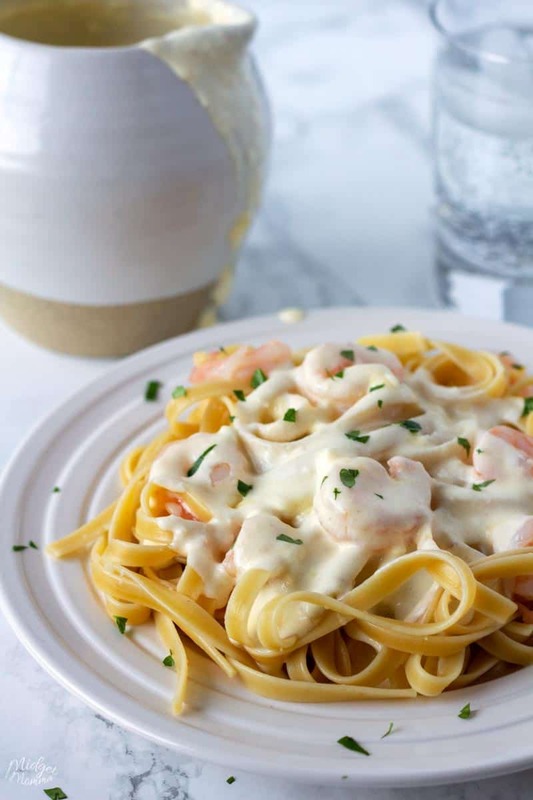 You will never make shrimp alfredo with jar sauce again after you have made this homemade alfredo with shrimp pasta recipe. 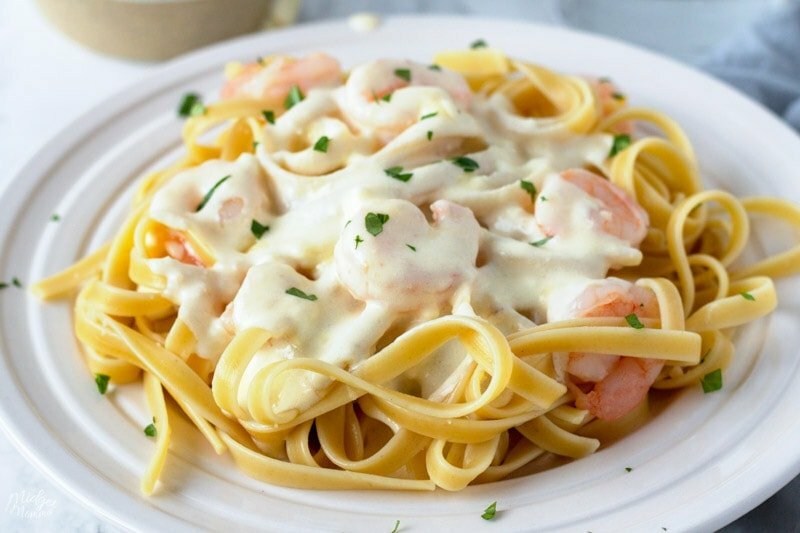 I do feel like I need to warn you about one thing that will happen when you make this shrimp alfredo pasta recipe…. you are going to have to make it again and again and again because your family is going to ask for it often because it is THAT good! 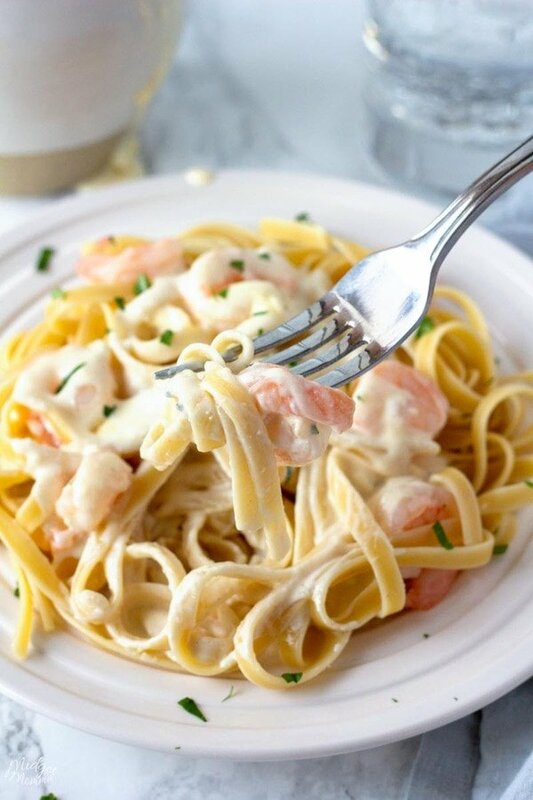 This shrimp alfredo pasta can be made with any of your favorite pastas. I use whatever I have on hand including the spiral noodles, fettuccini noodles, and penne pasta and they all work well. Change things up, make it fun and have fettuccini alfredo with shrimp, Penne alfredo with shrimp, and well you get the point. The pasta fun is endless and amazingly tasty every time you eat it! You can also change this up by adding veggies to it. I personally change things up by making it shrimp alfredo with broccoli by adding steamed broccoli to it. You can make this shrimp spinach alfredo by adding steamed spinach. Again just like the pasta changes you can make, the veggie changes you can make this recipe for shrimp alfredo so easy to change up when you need to. Of course I am totally for keeping it a basic because this really is the best shrimp alfredo recipe. You can make this shrimp alfredo pasta recipe even more awesome by making homemade pasta to go with it. However, boxed pasta will work just fine too and still give you an amazing dinner that tastes just like the Olive Garden Shrimp Alfredo. This easy shrimp alfredo makes enough for using with a 1 pound box of pasta and feeds our family of 5 with leftovers. You can easily double and triple the recipe if needed. If you really want to ramp up the game you can grab some Olive Garden Salad dressing here and then put it on your salad. Plus they make Olive Garden Croutons too!! 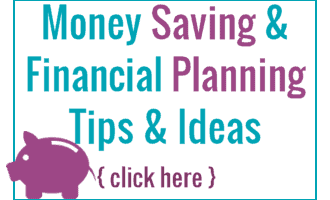 You can really have the WHOLE shebang right at home!! 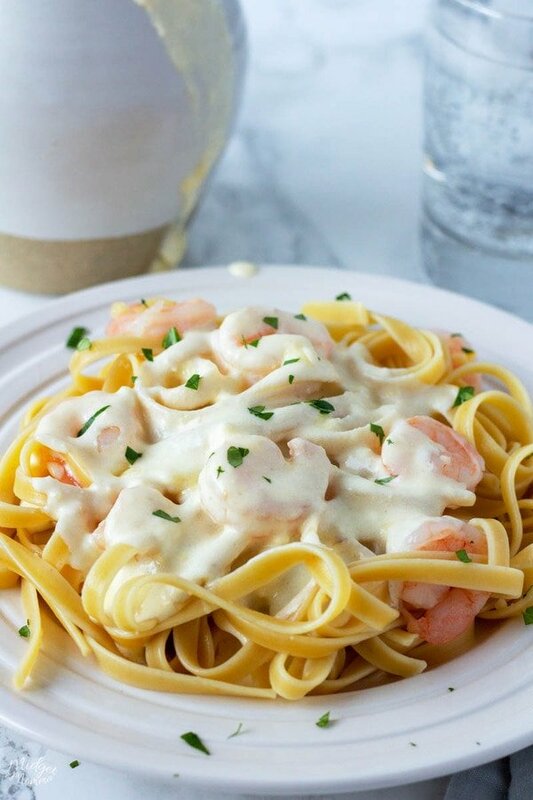 This shrimp alfredo is a perfect dinner recipe. 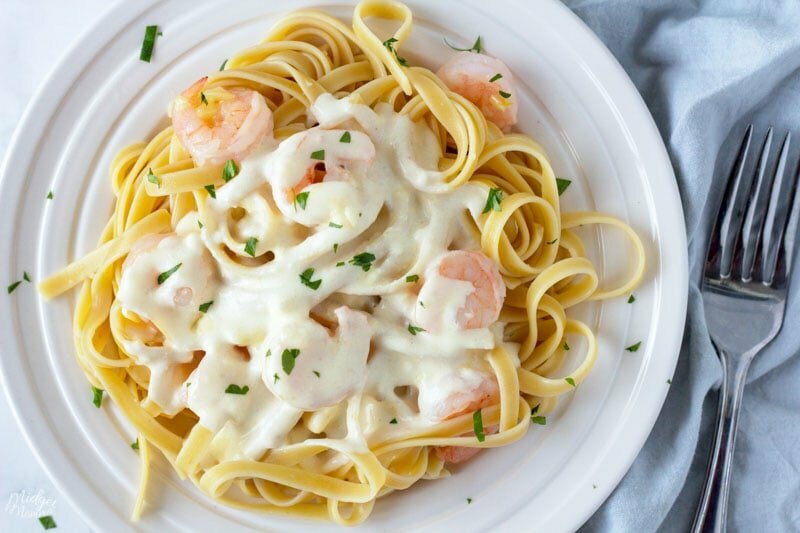 Creamy rich alfredo sauce with shrimp over pasta and super easy to make. Clean and shell the shrimp, and cut into bite sized pieces. Saute with 2 tablespoons butter and garlic on medium low heat until the shrimp are pink and set to the side. Start cooking your pasta according to the package. While pasta is cooking it is time to start making your sauce. Melt butter and cream cheese in a sauce pan over medium heat. The cream cheese might look a bit strange, but stir it till you have it as smooth as you can get it. Add Parmesan cheese and garlic powder and stir until everything is mixed well. Turn off the heat, sauce will thicken as it cools a little. Drain your pasta and add in cooked shrimp and alfredo sauce and mix well. Nutrition information is for shrimp and Alfredo Sauce. This alfredo sauce goes great over pasta or zoodles. Add in the nutrition information for the pasta or the zoodles that you are using to find the full nutrition information. 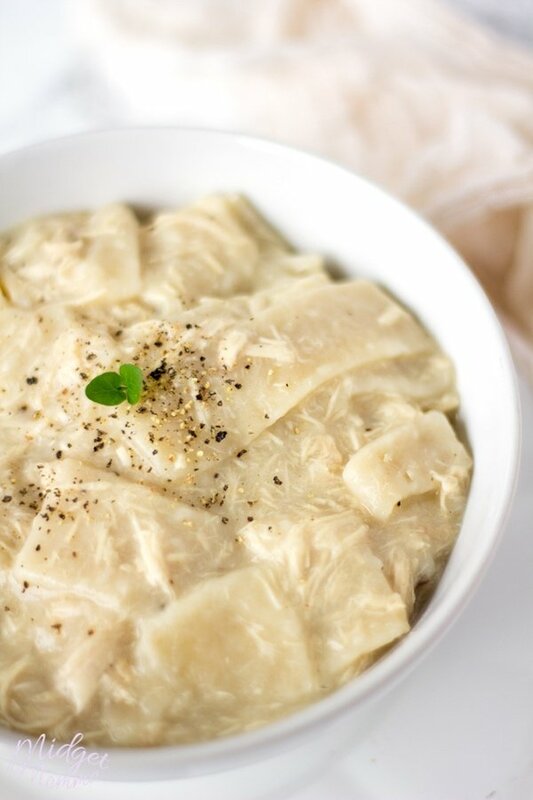 Love Alfredo? Make sure you check out our Chicken Alfredo Recipe! It is Delicious! If you don’t want to have a ton of dishes, then this One Pot Chicken Alfredo is a perfect option! If you are doing Keto then you can use the sauce recipe just serve it over homemade Zoodles!! How much shrimp did you use? This is what I want to know too. How much shrimp? I just used 14 extra large shrimp. Would half and half work instead of whipping cream? In a pinch you can use it but for the creamy texture heavy cream is the best. This was way to much sauce for the amount of noodles. It was swimming in sauce. I suggest maybe doubling the noodles if your going to use all the sauce it makes. Pretty thick as well. Overall it was ok.
How many cups does the 6 oz of Parmesan equal? No it will turn out to thin. A quart of heavy cream is a lot. Did you mean a pint? The recipe calls for a pint … which is correct? Do I drain the shrimp from the butter? I have a lot of liquid in my shrimp. yes 🙂 Remove the shrimp from the butter after they are done cooking.